Hanger type shot blasting machine can be used for shot blasting small, medium and large components. 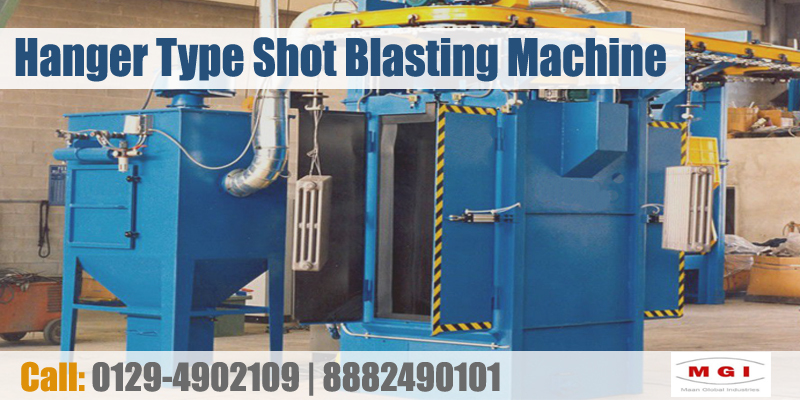 It is the most flexible and versatile shot blasting machine of all that are available with us. It comes in two options the standard single door option or two door option with the hook mounted on the door. Hanger type shot blasting machine can be split into categories the batch type machine in which a batch of components moves in hanging on the hanger, starts rotating and gets blasted. When one batch completes the second batch can be loaded for blasting. The other one is the continuous type machine with a monorail system that moves the parts continuously through the machine. In this type of shot blasting machine the components to be blasted are hooked to a fabricated hanger which is suspended on the machine hook that moves through the machine thereby exposing the components to a stream of abrasives being propelled by the two blast wheels on the side walls of the machine. Batch Type Machine – It is an ideal machine for reconditioning of metal parts and metal components in the most economical way. Procedures like desanding and decoring of components that are susceptible to impact damage or breakage can be easily carried out. Both small and large parts can be blasted quickly and economically. Continuous Type Machine – These machines have a monorail system that moves the components to be blasted continuously through the machine as mentioned above therefore the production sequence is automated resulting in an efficient and a very cost effective blasting process. These machines are customized based on the requirements of the customer and mono rail system can be customized to suit the specific needs. 1) Two nos. 12½” size blast wheels are mounted on side. Depending upon the requirement and size of job. 2) During the blasting operation used shots falls into the longitudinal screw conveyor provided below the blast cabinet. From there the shots are transferred into the boot of bucket elevator. 3) The bucket elevator lifts the media and pours into the media separator where continuous screening is done to remove the debris from the blasted media. The screened media falls into the air wash type media separation system where the media is air washed to remove the dust particles from the usable shots and finally they are collected in a storage tank of suitable capacity for recycling to the blast wheel. The debris from media separator and unusable media from media separation system is collected in a bin [Buyer to arrange bin]. 4) A suitable size of ducting is connected between blast cabinet to dust collector. The dust and fines from blast cabinet is sucked and is carried into the fabric bag dust collector. The dust particles gets collected in the hopper and clean air is discharged into the atmosphere, keeping the environment clean and healthy. 12. Number of Bags 24Nos. Aluminium die casting industry uses these machines to clean the components effectively. Components that are heat treated such as Gears and crank shafts are cleaned effectively. Tractor components, Forged components and Castings are cleaned effectively. Surface preparation before powder coating or recoating of the components. Small and Large components such as engine blocks and Pump castings are cleaned in an efficient and economical manner using the Hanger type Shot Blasting machine. 1) Blast Cabinet Blast cabinet is manufactured from prime quality heavy duty steel plate of 6 mm & 8 mm respectively and mounted on rigid structural steel frame work. The blast cabinets internal surface are provided with 6-8 mm thick manganese steel hard liners in the direct blast zone for protection from abrasion. The blast cabinets are provided with heavy duty perforated sheet on the screw conveyor for the transfer of shot to the hopper for recycling.The cabinet includes the required openings for conveyor, doors and access to the Blast Wheel units with limit switch interlock and automatic interlock to prevent operation of machine while the doors are open. Cabinet is provided with hinged type access door with wear plates assembled in place. Cabinet includes four sets of frame wear plates located and assembled inside the cabinet at the Blast Wheel openings. The cabinet in the direct blast zone is lined with 8-6 mm Mn steel liners rest cabinet is lined with 6mm Rubber sheet. 2) Blast Wheel Assembly: This is the most important part of the shot blast system that propels abrasive media on to the components at adjusted speed and direction. Blast wheel is the main part of the machine that fulfills the main function of the machine. There-fore correct adjustment and maintenance is very important. The blast wheel assembly is mounted on a 12 mm thick plate. It consists of two numbers blast wheels of size 12½” x 2½”. Each wheel consists of fabricated steel casing, alloy steel liners, rotor, blades, control cage and feed spout. The rotor is made out of EN grade material duly hardened to the full depth. The rotor is made out of EN grade material on CNC & VMC machines to the finest accuracy duly hardened. Each blast wheel is coupled through self lubricated and self aligning pedestal bearings. The rotor is dy-namically balanced and the drive shaft of the blast wheel is made out of EN grade material and duly precision grinded. The machined parts of each wheel are prepared on VMC (5 Axis) & CNC machines to get higher accuracy and smooth fitment. Changing of blades and other components dismantling is very easy to maintain. Steel shots go into the impeller from feed spout. Impeller and blades continuously rotates at high speed by means of motor, cage does not turn. Steel shots in the impeller come out of cage and drop onto rotating blade. Blade throws steel shots with high speed from the opening located at the bottom of wheel. In order to assure a good operation, impeller, cage and blades should be correctly adjusted; Abrasions occur on the parts that are in contact with abrasive media that distributes the directional flow of shots. Abrasive Circulation System The rotor of blast wheel assembly unit fires abrasive down on the perforated belt. The spent abrasive from perforated belt top falls into hopper of the cabinet. The abrasive from hopper slides down to the screw conveyors, which trans-fers them to the boot of the bucket elevator. These shots are elevated to the desired height with the help of buckets mounted on rubber belt. The tensioning arrangement for elevator belt is provided at the top portion of the elevator, hence no spillage of belt. A media separator is housed within the separator. Oversize contaminants and the media mixture are discharged from the head section of the bucket elevator into the media separator by means of an upper screw conveyor. The trashes will be directed by the internal screw flight to a trash and the air currents remove the contaminants. The dust and useless fines will be air borne to an expansion chamber from where coarse material will drop into a refuse hopper and thereafter to the floor level through dribble valve control. The fine dust particles will be conveyed through vent piping to the dust collector. The abrasive conveyed by the screw conveyor is elevated by the bucket elevator to the top where it enters the media separation unit. The media separation unit consist media separator which continuously segregate usable abrasive from blasted media and debris. The media separation unit is air wash type separation system receives media and dust after media separator. The separation unit consists of baffles which generate a curtain of abrasive & dust and an air current is passing through the curtain which air washes the media thereby removing dust from the blasted media. Contaminants are removed by the separation unit for disposal by user [Buyer to arrange bin] and are discharged through chute. Reusable abrasive falls into the storage hopper for re-circulation. The storage hopper is provided at the bottom of bucket elevator. The abrasive from storage hopper are transferred into the blast wheels through feed funnel. The flow of shots to the blast wheel unit is regulated by the dribble valve which is actuated by pneumatic cylinder. The bucket elevator is fabricated from 5 mm thick steel sheet at boot, Top section is 2.0 mm thk. and trunk section is 3.0 mm. The fine dust laden air sucked from the cabinet enters into the dust collector. It passes through filter bags where the dust particles deposit on the surface of bags and clean air discharges into the atmosphere. Filter Bag Area : 24 Sq. Mtr. 5) Ducting: Suitable ducting from blast cabinet to dust collector is provided. However, ducting beyond the exhaust fan is to be arranged by the buyer. Ducting is constructed by 14G mild steel sheet. 6) Colour / Painting : Inside and outside surface of equipment will be brush cleaned and given two coats of Red Oxide Primer. Final coat on exterior of system is Synthetic Enamel Air Drying, Shade: As per Buyer’s Choice, which will be done at site. NOTE: All above dimensions are approximate. The system’s design may be changed without affecting its rated capacity. With over 2 decades of combined experience in the Automotive OEM industry and the blasting industry we offer the most economical and high quality shot blasting machines in India. There are many manufacturers and traders of shot blasting machines in India but our focus is not on sales but on the providing our customers with high quality shot blasting machines and a prompt after sales service. All our shot blasting machine are made of highest quality of raw materials and have longer life and this is what makes us the best manufacturer of Hanger type shot blasting machine in India.